How Does an Onsite Election Work? With all the talk about online, phone, paper and hybrid elections, it can be easy to forget that a significant number of member elections include an onsite component. In 2015, Survey & Ballot Systems was onsite at 10 percent of client elections. This in-person voting component at annual meetings continues to be an important, effective and often convenient option to offer members. But how, exactly, does an onsite election work? Each organization has unique needs and voting is customized to each situation. There are, however, general processes and procedures that apply to most onsite elections. Your third party election vendor should consult with you prior to your organization’s annual meeting to discuss the process from start to finish. From the venue’s floor plan and crowd control to member registration and voting booth placement – each detail is important to ensure every member is able to vote and keep the meeting on schedule. After the action plan for your meeting has been determined, your election vendor should meet with staff and any volunteers to discuss all voting procedures. Your election vendor should also be onsite prior to the event to setup and test any necessary equipment. The day of your organization’s annual meeting, any members who have not voted online or by mail can bring in their ballots or can cast an “onsite ballot” at the meeting. This procedure is usually determined by your organization’s bylaws or governing articles. Be sure that your election vendor adheres to these practices and procedures throughout the onsite election. 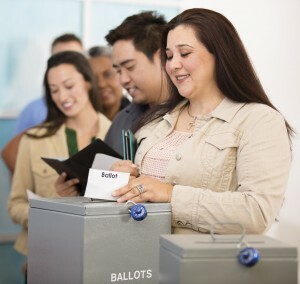 It’s important for your election vendor to be able to distinguish between members who have voted before the annual meeting and members who are voting at the meeting. Ballots differing in size, color and/or layout can be provided to ensure members will cast the appropriate ballot. Volunteers will be coordinated by your election vendor so everyone knows how to inspect for ballots that do not include a signature or do not follow other established election protocols. It is vital to know and communicate the procedures in place for any questionable ballots. At the end of your election, a certified report will be generated so your organization can make it official. A vital piece of your onsite election is to partner with a third-party election vendor you can trust. Be sure your election vendor has a great deal of experience managing onsite elections and ask for testimonials and recommendations to ensure their customers are satisfied.